This chickpea salad recipe is super easy and completely delicious; it takes only about 15 minutes to make, and there are so many ways to serve it — as a sandwich, appetizer, or dolloped into a lettuce leaf. 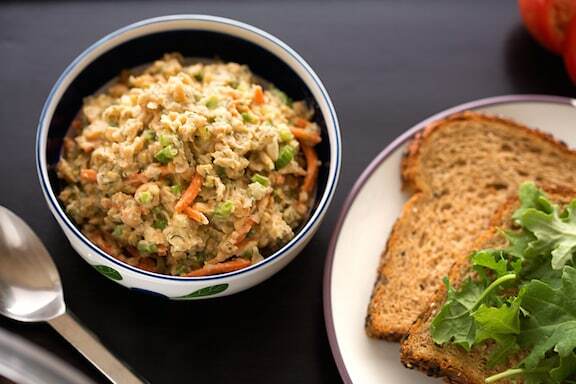 The hint of sweet pickle relish really gives this preparation a great flavor! See suggestions following the recipe. Recipe contributed by Sharon Nazarian, from Big City Vegan. Photos by Hannah Kaminsky. This chickpea salad recipe is super easy and completely delicious; it takes only about 15 minutes to make, and there are so many ways to serve it — as a sandwich, appetizer, or dolloped into a lettuce leaf. Mash chickpeas in a bowl with a potato masher until there are no whole chickpeas left. A potato masher works best but if you don’t have one, you can use a fork (or for the totally lazy, place the chickpeas in a food processor and pulse on and off until finely chopped). Combine the mashed chickpeas with the remaining ingredients and mix together. Serve as suggested below. Note: Depending on what brand of chickpeas you use, you may or may not need to add additional salt. Some canned beans have more salt than others. You can buy no-salt added chickpeas for complete control over your sodium intake. You could also soak and cook your beans instead of buying canned. This requires a little extra work but can be more economical. Serve as a sandwich with toasted bread. 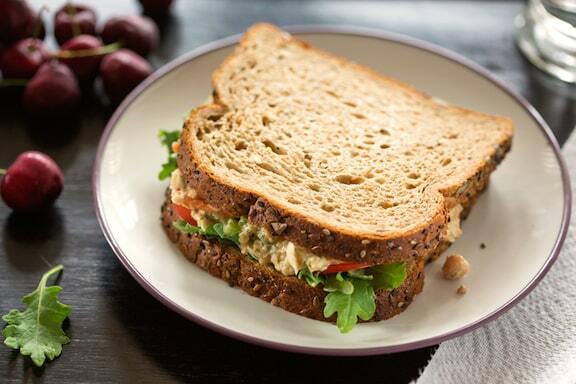 Try it on Food for Life Ezekiel bread with sliced tomatoes, or your favorite multigrain bread over a bed of greens, like baby spinach, baby kale, or romaine lettuce. Or make romaine lettuce boats. Just scoop some chickpea salad onto a romaine lettuce leaf – so good and refreshing. This is also delicious on whole grain crackers or stoneground tortilla chips served as an appetizer. Explore more of VegKitchen’s Vegan sandwiches and wraps. I get posts for so many amazing looking recipes on facebook, but when I follow the link and go to this sight, it won’t let me pin it. Somehow the picture that is posted with the recipe doesn’t transfer to pinterest and I guess they won’t let you post it without a picture. I notice that other people are posting these on pinterest. Can you give a me a tip on how to do this? Winter, so sorry about this. We do have intermittent trouble getting things posted on Pinterest, and will continue to try to resolve the issue. Thanks for your interest! Question: Do you drain the chickpeas before mashing? Oh, good catch. Yes, drained and rinsed. I just amended. just wondered if you recommend peeling the chickpeas (canned) or just use them as they are? If there are loose hulls, you can discard them, but in general, no, you need not peel the chickpeas. Still not able to pin it….. This recipe is a stroke of brilliance! I made it exactly as written, and it is satisfying and delicious. I ate it on a bed of lettuce. Yum! Thanks so much. For Pinning on Pintrest hover your curser or arrow over the image. The Pintrest Icon will show up on the picture. Do Not use the icons above the pictures, they aren’t working. since i am sooo totally lazy, i’m adding a small scallion to the food processor! i think it will be a delicious addition. please ignore previous comment! i just re-read the recipe! D’OH! No worries, Taza — despite all my recipes, I’m totally lazy, too. That’s why I like recipes that are really simple and quick the best! Yum! 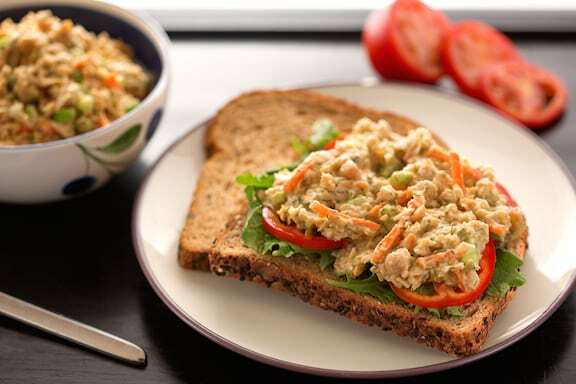 I used to love tuna salad and had been missing it. This fits the bill very well! I was out of lemons, so I used a lime. It is winter here, no chives untill spring, so I used a leek. It was tasty on romane leaves, seaweed rice crackers, and even pear slices! My picky autistic son loved it! What a nice light lunch, extra for a later snack! Thank you! This looks delicious. I tried to pin it. It shows the picture on my computer pin-it box, but when I attempt to finalize a new box pops up that says they can’t fetch the picture. So sad. But I did make a copy on my computer. Anxious to try this yumminess. Looks delicious, anxious to try this yumminess. Tried your suggestions, but still couldn’t pin it, so sad. Love this!!! Just followed the recipe to a “T” except I didn’t rinse my beans, because I cooked them fresh with rosemary and garlic. Drained and kept the juice to use as a vegan soup broth base. Fresh chickpeas just taste so much better than canned. Plus I don’t buy canned foods. The salad actually tastes almost exactly like tuna salad and even the texture is similar. I am so thrilled with this recipe. I’ve been looking for something I can take to work for lunch and not need to heat in a microwave. And I’ve also been trying to eat more protein, so for all these reasons this recipe is perfect! This is such an easy, delicious and satisfying recipe. Thank you Nava for sharing it with your fabulous readers. Suzanne, I’m using Firefox and didn’t have a problem pinning either photo. Maybe try a different browser. I used the Pinterest share button at the top of the post just under the title as opposed to the pinterest button on the photo. Add a little powdered Dulse (seaweed)and you have a good mock Tuna salad as well. Thanks for the suggestion, Martin. Dulse has a lot of nutrients, too. I don’t like relish, what do you recommend instead of it? Cathy, there’s so little relish in this, you can just skip it. But if you want a little something pungent, you can add a few chopped olives or sun-dried tomatoes. Is there anything I can use as a mayo substitute? I don’t like the real stuff or the vegan kind. Kimberly, you can use your favorite salad dressing, or some well-mashed avocado. Depending on the texture of the chickpeas (some canned or cooked chickpeas are a bit dry and crumbly, some are more moist), you do need some kind of moistening in this. Hope you enjoy it! I have a similar recipe, but instead of mayo, some tahini and miso give it a great flavor, although I love the avocado idea. I do get lazy , so throw not only chick peas, but also carrots and onions in a small food processor . When the beans are a little more chopped , it all stays together. It makes such a satisfying meal. Thanks ! I’m a big fan of ceasar salad and even more so now that you’ve shared this recipe. It’s such a great twist on a classic recipe. Sharing and pinning for later. Thanks so much for sharing this with us on #shinebloghop this week! Hi Sarah, this particular recipe always gets eaten so fast that we’ve never had occasion to freeze it! It will last several days in the fridge, but I can almost guarantee you that it will be devoured quickly. This is my new favorite sandwich!